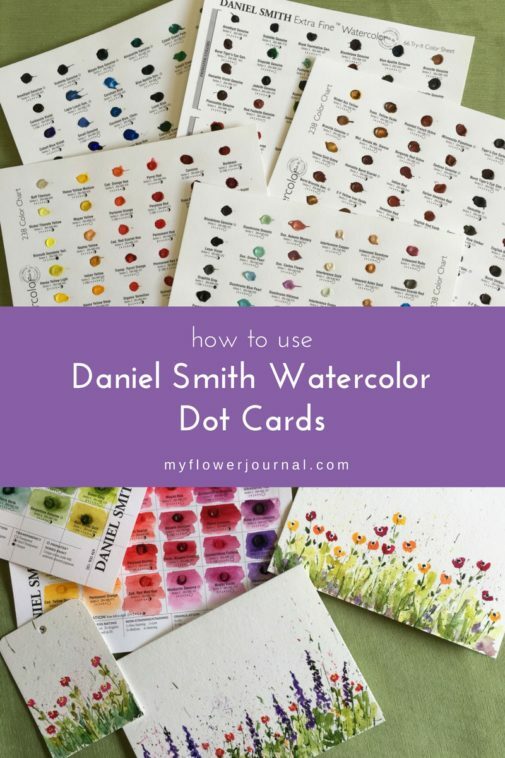 Daniel Smith Watercolor dot cards are such a fun and affordable way to play with watercolors and discover new colors. They are a great way for someone new to watercolors to try some professional quality paints without investing a lot of money initially. 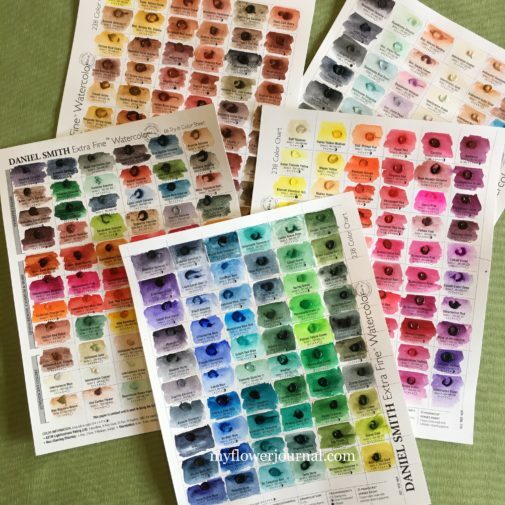 For those of us who have plenty of tubes of watercolors but are always looking for a new color the dot cards are a good way to test colors before spending $10 or more to buy a tube. More and more artists are discovering the rich colors and superb quality of the Daniel Smith watercolor brand. I have used a variety of watercolor brands over the years, but now use the Daniel Smith brand almost exclusively. I bought the dot cards a few years ago and have used them off and on to compare different paint colors. This is what the dot cards look like when you buy them. 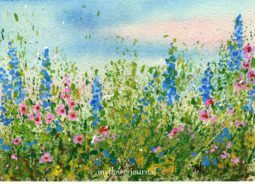 Small dabs of paint have been placed on watercolor paper to dry into dots. The name and details of each color is below the dot. I took this photo after I had tried a few colors so few have been wet with a drop of water, had a little color picked up with a brush then left to dry out. I recently saw an idea on Pinterest to turn the paint cards into swatches. I used a ruler and pencil to add grid lines to the dot cards. Then I used a brush and clean water to add a small drop of water to each color dot. I did about three rows at a time. After the paint had softened I used brush and painted a swatch of the color in each square. This was insightful in several ways. First I could see how the color reacted to water. Some colors just come alive with a drop of color. Others take a little more coaxing to cover the paper. Second I could see what the actual color was with more or less water added to it. Third I could tell how transparent or opaque the color was by how well I could read the printed name of it after I painted over it. The dot cards looked so pretty after I was done! I wanted to keep them out where I could admire them. Even after going through this process there is still plenty of paint to use for small projects or to play with the color combinations. 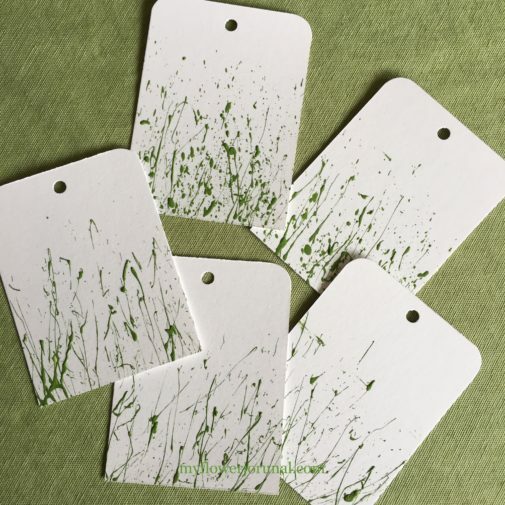 I usually have some watercolor cards or gift tags that are splattered with acrylic paint on hand for when I need an easy, relaxing project. 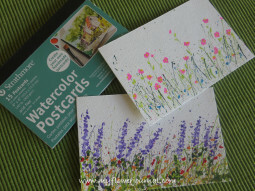 I used some of these cards with splattered paint and added watercolor flowers using the paint on the Daniel Smith dot cards. Look how many pretty flower colors there are too choose from! These are some of the cards I painted using the dot cards. I could do many many more cards from the remaining paint dots. 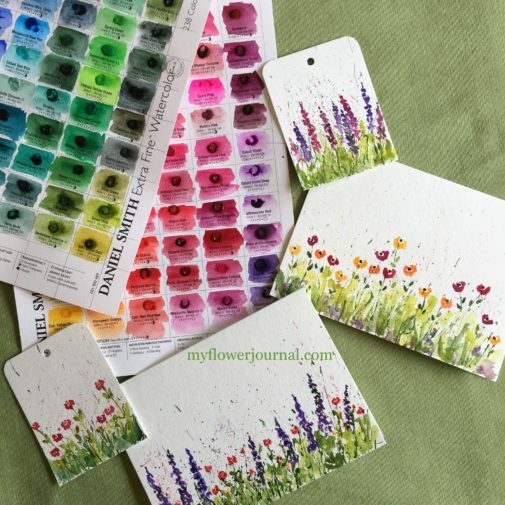 Some colors have smaller dots of paint than others, but there are so many to choose from you could paint many small watercolors from one set of Daniel Smith dot cards. This is why they are so good for someone new to watercolors. They could try a lot of different colors before investing in tubes of paint. I currently use the Daniel Smith Essential Six plus a few more of my favorite colors like sap green and cobalt teal. 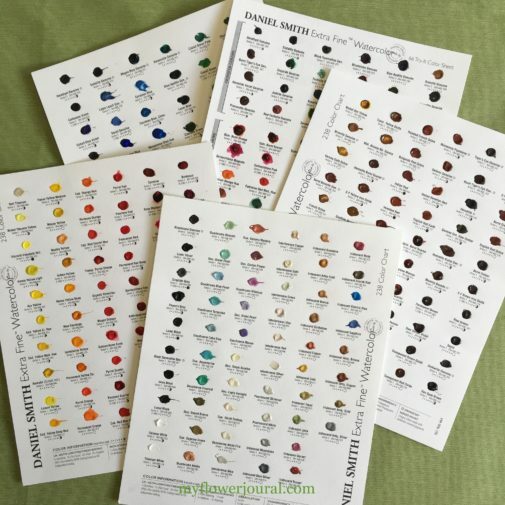 So if you want to play with lots of color or need a good gift for someone new to watercolors give the Daniel Smith Watercolor dot cards a try. Learn more about how I splatter paint and turn it into flower art by clicking on a picture below.